The International Criminal Court (ICC) must better communicate what is driving its actions to the public of the Middle East and North Africa (MENA) and elsewhere around the world if it is to develop confidence in its capacity to act as a guardian of international criminal law. The number of developments relevant to the court’s mission is growing by the day: from direct involvement in Libya to potential involvement in Israel and the Occupied Palestinian Territory, from crimes committed in Syria, Yemen and Bahrain—which ultimately may come under its jurisdiction—to impending ratifications of the Rome Statute by Tunisia and Egypt. International courts face enormous challenges in building a sense of ownership among the communities affected by their work due to numerous factors, including distance (both physical and cultural), use of languages and rules often unfamiliar to the people under their jurisdiction, and, most importantly, hostile rhetoric often employed by some local opinion makers. The ICC is no exception, especially in the MENA region where its engagement requires a robust outreach effort. On May 16, the court’s prosecutor, Luis Moreno-Ocampo, delivered the news of his application for arrest warrants against Colonel Muammar el-Qaddafi, his son Seif al-Islam and Libya’s head of intelligence services Abdullah al-Senussi on charges of crimes against humanity. The charges relate to the attacks of Qaddafi’s security forces on the demonstrators who have protested against his regime since February. And while this action of the prosecutor was warmly welcomed by all who support accountability for leaders who violently suppress their own citizens, questions emerged in the MENA region and beyond about the criteria that determine where and when the ICC gets involved. People in the region, including civil society groups promoting rule of law and directly advocating for the ICC, questioned how Qaddafi’s conduct differed from that of Assad in Syria, Saleh in Yemen or al-Khalifa in Bahrain. The immediate response to this query would be that the Libya situation was referred to the ICC by the UN Security Council. This is one of the mechanisms triggering the court’s jurisdiction that has not been applied thus far in the cases of Yemen, Syria or Bahrain. The ICC can exercise its jurisdiction only if the state where the crimes have occurred, or from which perpetrators come, accepts its jurisdiction, or if a case is referred by the UN Security Council acting under Chapter VII of the UN Charter to maintain or restore international peace and security. Yemen, Syria and Bahrain are not parties to the Rome Statute and it is difficult to believe their current rulers are eager to accept the court’s jurisdiction. The court cannot control what the Security Council refers to it, but only to determine if there is a reasonable basis to open an investigation in case of a referral. This does not mean Security Council referrals are bereft of political considerations. The speed with which the Security Council acted to refer Libya to the ICC, and its deafening silence on similar violence against civilians elsewhere in the Middle East, especially in Syria and Yemen, could leave the impression that powers dominating the council are turning to the court only when politically convenient to their interests. This, coupled with a lack of response from the prosecutor to the Palestinian Authority’s January 2009 recognition of the ICC’s jurisdiction—intended to enable the court to investigate alleged breaches of international criminal law committed during the 22-day conflict in Gaza and southern Israel in 2008–2009—threatens to undermine the court’s credibility in the region through allegations of double standards. The ICC cannot allow for these perceptions to cement, but should actively work to address them. The recent conference on the ICC in Qatar and the resulting attention the court received in the regional media can be seen as a positive step. However, a more substantive and diverse engagement is necessary to achieve the desired degree of understanding and acceptance. The ICC needs to be active in establishing a strong outreach presence in the MENA region to actively disseminate information governing its jurisdiction and work with media and civil society groups who can further distribute it. Its online presence must be broadened to the region and Arabic included as a language of communication on the ICC website. But more than simply providing explanations of the Rome Statute and distributing its digests and documents, the court needs to engage. Prior to the conference in Qatar, senior ICC officials, including the prosecutor Luis Moreno Ocampo, rarely visited the region. Now is the time to do so on a more regular basis, to demonstrate the ICC’s relevance to ongoing events in the region, and send clear messages about its mandate to dispel allegations of bias or politicization. Involving prominent legal and academic figures from the region and elsewhere—the likes of former ICC president Philippe Kirsch or former judge Mohamed Amin El Mahdi of the International Criminal Tribunal for the former Yugoslavia (ICTY)—who would be able to speak about the ICC and provide analysis without the constraints of being ICC staff could be a substantive step forward. The role of civil society cannot be overemphasised in this effort. To add to the work of the Coalition for the ICC, which has worked with local NGOs to lobby for the ratification of the Rome Statute, the ICC itself needs to establish strong links with relevant civil society groups that will spread its message and help counter misperceptions in their constituencies. Calls for justice and accountability have been heard in Tunisia, Egypt and across the region. It is telling that one of the first decisions of Tunisia’s interim government was to initiate ratification of the Rome Statute and that interim authorities in Egypt have announced the intention to do so. If the ICC is to engender the trust of people seeking justice in the region and across the world, and to relay a strong message that there can be no impunity for crimes against humanity, it has to clearly communicate what makes it act in one situation and not in another. This article appeared in both The Daily Star and Ahram Online. 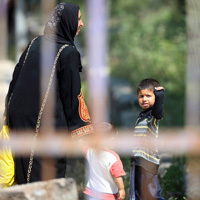 Photo: Syrian refugees stand behind the fence of a refugee camp in the Turkish border town of Yayladagi in Hatay province (2011). Reuters / Osman Orsal.